In a large skillet, saute the chicken, onion and green pepper in oil until chicken juices run clear; drain. Sprinkle with chili powder and garlic powder. Place crust on an ungreased 12-in. pizza pan. Spoon chicken mixture over crust. Top with picante sauce; sprinkle with cheese. Bake at 450° for 10-12 minutes or until cheese is melted. Yield: 6 slices. Personal Review: Deciding to make this pizza was kind of a spontaneous thing. I was planning on making a normal pepperoni pizza, but my husband had spotted this recipe in my notebook and suggested it instead of the old standby. I have to admit, it wasn’t my favorite, but it wasn’t bad either. There was just something about it. I think my problem is that I’m not very adventurous when it comes to my pizzas. But hubby thoroughly enjoyed it and I’m sure I will be making it again in the future. 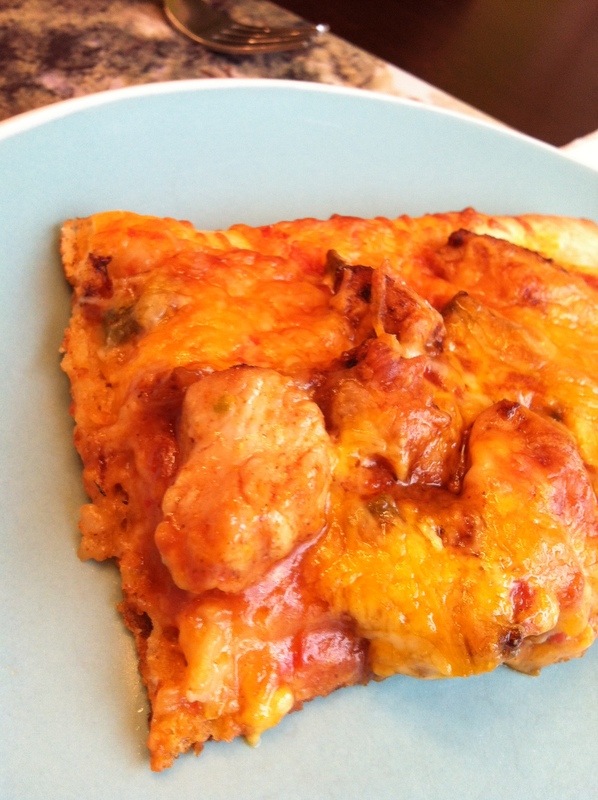 One change I made was that I spread some of the picante sauce on the crust directly – like you would pizza sauce. I don’t think it was necessarily a change that would need to be made, but one that I preferred. Bottom Line: If you want to step outside of the pepperoni & cheese pizza, give this one a shot. It’s not too weird (apples & pineapples? I still don’t understand that combination) and yet it’s definitely outside the norm.